The federal appeal lawyers at Kassouni Law bring experienced advocacy in the field of Federal appellate litigation. With a focus on developing unique legal strategy and exceptional legal writing, our attorneys share an unwavering commitment to their appeal clients. With offices in Sacramento and Los Angeles our Los Angeles appeals lawyers and Sacramento appellate attorneys dedicate themselves to each case as if it were their own serving clients throughout the state of California and Ninth Circuit Court of Appeals Jurisdiction. If you have a question about your Federal Appeal, give us a call at 877-770-7379. Federal appellate attorney, owner, and managing partner Timothy Kassouni will speak with you personally. The federal appeal process begins with the issuance of a judgment by a federal court judge. From the date of entry of the judgment you will have 30 days to file a notice of appeal. Federal jurisdiction is most commonly triggered if there is a case involving a provision of the United States Constitution, a federal statute, a bankruptcy issue, or a dispute between citizens of different states in an amount exceeding $75,000. Disputes involving Constitutional or federal statutory provisions give the federal district court subject matter jurisdiction, whereas disputes involving citizens of different states give the federal district court diversity jurisdiction. The Federal Court of Claims in also the exclusive forum for cases for damages against the United States government. For example, all claims against the United States government for a taking of property without just compensation must be brought in the Court of Claims. Timothy V. Kassouni is admitted in all California federal courts, as well as the Court of Claims. Appeals from federal district court judgments in California, Oregon, Washington, Hawaii, Idaho, Nevada, Montana, Arizona, Alaska, the US Trust Territory of Guam, & the US Commonwealth of The Northern Mariana Islands are brought before the Ninth Circuit Court of Appeals. The standards for appeal are virtually the same in the Ninth Circuit and the California state courts of appeal. If you are appealing from an adverse federal court judgment, you must typically establish that the court committed an [gs error of law], or that there was a lack of substantial evidence to support the court or the jury’s factual findings. For example, if the trial court or jury concluded that the light was red at the time of a collision, with no witness statements, photographs, or other evidence that indicated the light was red, the factual finding lacks substantial evidence in the record and may be overturned on appeal. Similarly, if the only evidence that the light was red was hearsay testimony or a photograph that was not properly authenticated, the trial court may have committed legal error in admitting the evidence and the verdict can be overturned. Also, as in state courts of appeal, the Ninth Circuit only examines the record from the trial court, the briefs of counsel, and the statements of counsel during a brief oral argument. New evidence that was not brought forth in the trial court will usually not be considered for the first time on appeal. It is important to request all relevant trial court transcripts and documents, which will be the record the court of appeals relies on when considering the appeal. Even if the Ninth Circuit affirms the judgment of the trial court, your case is not over. You have an opportunity to seek review by the United States Supreme Court by filing a Petition for Writ of Certiorari. 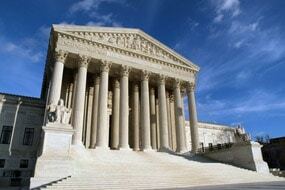 However, unlike the Ninth Circuit, the United States Supreme Court selects the cases it wishes to hear. If the Ninth Circuit decision created a conflict with another court of appeals decision, or if important questions of federal law are raised, the United States Supreme Court may elect to hear your case. It is important to seek what is called amicus curiae support when a certiorari petition is filed. Amicus curiae is latin for “friend of the court.” Amicus briefs are typically filed by organizations which support your desire for Supreme Court review. At Kassouni Law, our Sacramento appellate attorneys and LA appeals lawyers when necessary, lobby non-profit legal oganizations to provide amicus briefs on behalf of clients. Sacramento appellate attorney Timothy V. Kassouni is admitted in both the Ninth Circuit Court of Appeals and the United States Supreme Court. He is happy to discuss your federal appeal issue by calling 877-770-7379.